Rugged TDA2Px / DRA77xP dev kit enables synchronous acquisition of eight 4Gbps FPD-Link™ III SerDes capture streams with real time processing and analytics. Rochester, NY – Oct. 29, 2018 – D3 Engineering, a Texas Instruments platinum design partner, announced its DesignCore® RVP-TDA2Px Development Kit for autonomous systems development. The production-intent kit features TI’s TDA2Px SoC processor and 4Gbps FPD-Link™ III SerDes interface. 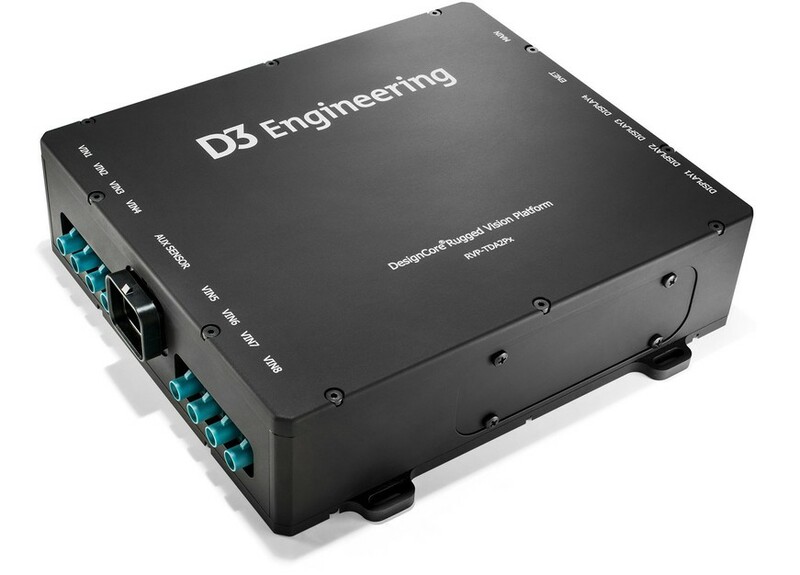 D3 Engineering’s Rugged Vision Platform (RVP) allows rapid technology evaluation and system development under realistic on-vehicle conditions. It accelerates development of Advanced Driver Assistance Systems (ADAS) and autonomous systems, and provides a streamlined path to production. Automotive applications include camera monitoring systems (CMS) such as multi-camera/multi-display mirror replacement, 3D surround view with car black box, and front or rear cameras with analytics; driver monitoring; stereo vision; sensor fusion (radar, ultrasonic, and LiDAR); and in-vehicle infotainment and telematics. Other applications include autonomous shipping and transportation, autonomous guided vehicles (AGV), collaborative robotics, and industrial vehicles. The SOM processor board features a TDA2Px/DRA77xP SoC processor with internal ISP. The SOM layout and BOM are optimized for production. The customizable baseboard supports eight 4Gps FPD-Link™ III SerDes capture streams with real-time processing and analytics. Four independent FPD-Link™ III display outputs are 1080p 60fps capable. The baseboard also has an expansion interface and multiple connectivity options. The automotive 9V to 40VDC power input stage has protection to 60VDC and reverse battery protection. Firmware in the kit includes an advanced vision software framework from D3 Engineering and the Processor SDK-Vision (Vision SDK) software framework from Texas Instruments. The enclosure is compact and rugged for on-vehicle or field testing. It is designed to support IP64 environmental ratings with a path to IP67. Purchase of a production-intent DesignCore Development Kit gives users license to evaluate the technology and use it as a platform for product development. D3 Engineering provides embedded system development services based on the development kit and other DesignCore reference designs to help customers speed time to market. D3 Engineering also provides rugged camera modules for use with the RVP-TDA2Px Development Kit and for ODM use in production systems. D3RCM rugged camera modules are fully-enclosed assemblies designed to IP69K, automotive, and industrial standards. Radar modules are also available for system development. The RVP-TDA2Px Development Kit is available now through D3 Engineering Design Services. The kits will be available for online purchase in November 2018 for $3,850.